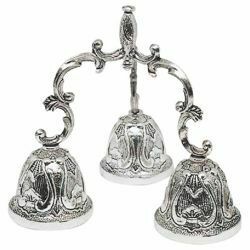 Selection of hand-held Altar bells and Sacristy Bells for Holy Mass, made from silver-plated brass, finely decorated with traditional sacred symbols and finished by hand by experienced italian handcraftsmen specialized in liturgical furnishings. Handmade economic altar sanctus bells, available with one tone or three tones. Excellent quality/price ratio and Quality 100% Made in Italy. 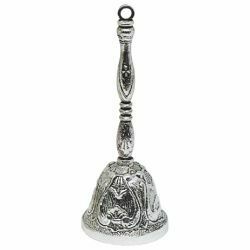 Liturgical Altar Bell produced by a historical Italian workshop of sacred furnishings.